A Maltese man living in Paris on Tuesday described how people around him could be seen “gasping” as a massive fire broke out at the Notre-Dame Cathedral on Monday evening. Speaking to Times of Malta, just hours after the major fire that sent flames and huge clouds of grey smoke over the French capital was controlled, Owen Farrugia said he was just 10 minutes away from the cathedral when the blaze started. Attending an event at the Assemblée Nationale, Mr Farrugia, who has lived in Paris for the past four years, said he immediately realised something was wrong when the sound of sirens reached an unprecedented level. “I was attending an event nearby, so the sirens could be heard. The blaring of sirens is normal in Paris but their frequency on Monday was out of the ordinary,” Mr Farrugia said. He recounted how people there gasped as news of the fire at the cathedral spread, with many refusing to believe the landmark risked being destroyed. “I have visited the monument plenty of times and walk past it at least twice a week. The general mood was definitely one of sadness and shock. People were speechless,” he said. While those who lived close to the cathedral were evacuated, many people arrived to witness what was happening, he said. “People could be seen praying and singing; some were crying and most of them gasped in shock and disbelief,” Mr Farrugia remarked, adding he chose not to get too close to the cathedral while it was still on fire as this was not a scene he wanted to witness. While the majority of the 850-year-old structure survived the fire and historic relics were saved, the spectacular Gothic spire collapsed during the fire. Fortunately, the iconic bell towers at the front were saved. 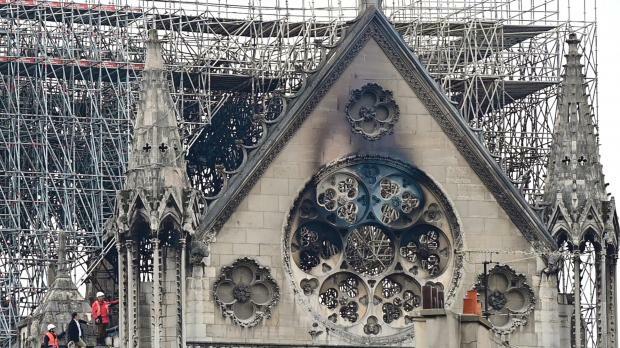 Mr Farrugia said people in Paris on Tuesday woke up to nothing but news of the blaze, with the fire at the cathedral being the topic of the day on all news channels. Many, he said, were still visibly in shock, adding that some firefighters remained on site and the roads around the cathedral remained sealed off. Transport lines had also been affected, he noted. Various countries and billionaires have pledged money to help restore the iconic building. Foundations and crowd-sourcing sites have launched several initiatives to raise money for the cathedral in central Paris.